This book analyses social democratic parties’ attempts to tackle inequality in increasingly challenging times. It provides a distinctive contribution to the literature on the so-called ‘crisis’ of social democracy by exploring the role of equality policy in this crisis. While the main focus is on analysing Australian Labor governments, examples are also given from a wide range of parties internationally. The book traces how a traditional focus on class has expanded to include other forms of inequality, including issues of gender, race, ethnicity and sexuality and explores both the intersections and potential tensions that result. Meanwhile there are new challenges for equality policy arising from a changing geo-economics (the rise of Asia), the legacies of neoliberalism and the impact of technological disruption. 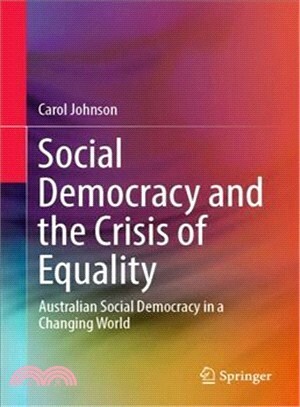 Carol Johnson is a Professor in the Department of Politics and International Relations at the University of Adelaide. Her main research interests are in Australian and comparative politics, the politics of gender and sexuality, the politics of emotion, and analyses of ideology and discourse. She also has a major interest in the domestic political implications of Australian (and Western) engagement with Asia. Her applied research focuses on how governments, particularly social democratic ones, manage social, economic, and technological change.